Will investors ever be comfortable? Well yes, of course, exactly at the right time to sell. Calm and complacency will most likely settle in once the economic headlines are on a clear path to recovery. At that point, the market, like a game of chess, will likely have already anticipated the recovery. At the end of the day, as great growth investor Peter Lynch said, it’s the direction of corporate earnings that will ultimately drive the market higher or lower. “People may bet on hourly wiggles of the market but it’s the earnings that waggle the wiggle long term.” Right now based on the strength of the rally, the market is telling us that third quarter corporate earnings should come in better than analyst expectations. Perhaps we get a yawner response (sell on the news reaction), or if improvement outright stalls, perhaps we will get the mother of all expected corrections? All these mind games make for an extremely tiresome investing mental tug-of-war. I choose not to get caught up in this game of market timing, but rather I choose to let the investment opportunity-set drive my investment decisions. I have taken some chips off the table during this rebound but I am still finding plenty of other fertile opportunities to redeploy capital. 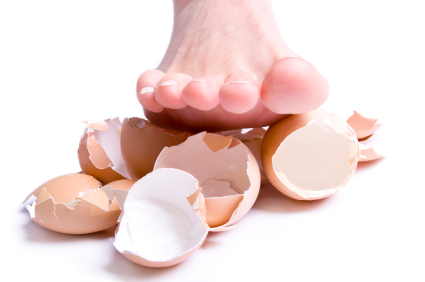 As others nervously walk on egg shells, I opt to clean up the mess and look for a clearer investment path. Entry filed under: Financial Markets, Trading. Tags: corporate earnings, emotion, investors, Laszlo Birinyi, Peter Lynch, walk on egg shells.